Every now and then (basically every time I start a new project), I get very excited and go on the hunt for inspiration. I really love that feeling. And sometimes, I start devising design ideas before I have the chance to chat with my clients in detail... The good news: it's always a great exercise in making cohesive concepts. Back in June, I posted the inspiration board called "Neutral Worth Noticing". It was very elegant and monochromatic, and all based on some hunches I had after reading one client email. Don't get me wrong - I love the board - it's just not totally the vision of the engaged couple. I know that because I have since been able to sit down with them and talk vision. This is the updated inspiration board, post client meeting. It's still mostly neutral but this time embracing subtle shades of greens, lilacs and pinks. 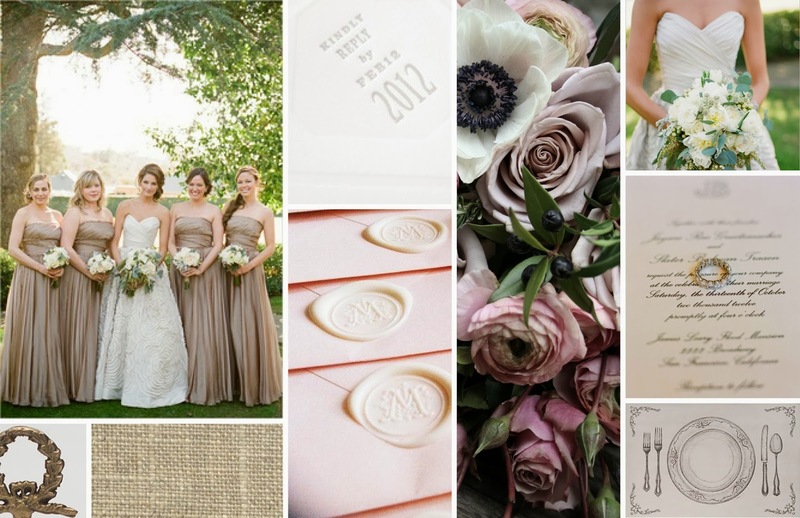 Even with a few of the same images, the board has a new feeling of soft, graceful femininity.